One of the biggest crazes in the stock market over the past year has been the marijuana stock boom, and one of the biggest knocks against that craze has been the valuation of marijuana stocks. Specifically, the “Big 4” marijuana stocks – Canopy (NYSE:CGC), Aurora (NYSE:ACB), Cronos (NASDAQ:CRON), and Tilray (NASDAQ:TLRY) – all have market caps of over $5 billion. Yet none of them has generated more than $150 million of sales over the past year. As a result, a popular view on marijuana stocks is that, given the fact that they are trading at 30-plus times their sales over the past year, they are wildly overvalued. I’ve never subscribed to this view because it lacks vision. You can’t take a growth stock, look at its current valuation multiples, and call it overvalued. That’s not how growth stocks are valued. Growth stocks aren’t valued based on what they are today. They are valued based on what they could be tomorrow. Tomorrow, marijuana stocks could be very, very big. I’m talking $100 billion big. From that perspective, $5 billion market caps today actually seem like a steal for long-term investors. It’s true that the cannabis market has a long way to go before it has fulfilled its potential, and during that time, its competitive dynamics will change dramatically. Thus, marijuana stocks carry huge risks because cannabis companies may not execute well. 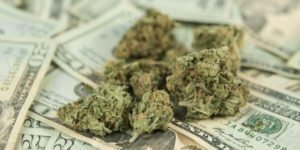 But make no mistake about it, the winners of this sector will eventually turn into $100 billion companies, and that is reason enough to gain exposure to marijuana stocks today. When it reaches its potential size, the recreational cannabis market shouldn’t look too different than the alcoholic beverage or tobacco markets. That’s because smoking weed isn’t all that different than drinking alcohol or smoking a cigarette. All three give you a buzz or get you high, are relatively inexpensive, and don’t require many additional resources. That’s why, among U.S. high school seniors, smoking cannabis is now far more popular than smoking cigarettes and is nearly as popular as drinking. The only thing holding up the cannabis market is legalization. But that’s coming along globally. Soon enough, given societal pressures, cannabis will be legal everywhere. Once it is, the legal cannabis market around the world should be comparable in size to the global alcoholic beverage and tobacco markets. The global alcoholic beverage market is worth $1.5 trillion. The global tobacco market is valued at $700 billion. Thus, one could easily say that the global cannabis market should grow to around $500 billion one day, especially if the medical side of the market is included. Within the massive global alcoholic beverage and tobacco markets, there are several very large companies. Among the largest alcohol beverage makers are Johnnie Walker and Crown Royal maker Diageo (NYSE:DEO), which has $60 billion in sales and a $100 billion market cap. There’s also Anheuser-Busch (NYSE:BUD), the company behind Corona and Budweiser which has $60 billion of sales and a $170 billion market cap. Finally, there’s Heineken (OTCQX:HEINY) with a $60 billion market cap, and Constellation Brands (NYSE:STZ), which has a $40 billion market cap. On the tobacco side, there’s Philip Morris (NYSE:PM) with $30 billion in revenue and a $130 billion market cap. There’s also Altria Group (NYSE:MO), which has a$100 billion market cap and British American Tobacco (NYSE:BTI), whose market cap is $90 billion. So the global alcoholic beverage and tobacco markets each have several $100 billion-plus companies. There’s reason to believe the global cannabis market will one day be as big as both of those markets. Consequently, there’s reason to believe that today’s marijuana stocks could one day be $100 billion companies. The math behind an eventual $100 billion valuation for marijuana stocks isn’t all that complicated. In the alcoholic beverage and tobacco markets, the largest companies obtain roughly 4% of each sector’s revenue. Assuming the cannabis market reaches a comparable yet conservative $500 billion, the annual revenue of the world’s largest cannabis companies could theoretically become $20 billion. Operating margins in the alcoholic-beverage sector usually run around 30%. They run around 40% in the tobacco space. Assuming cannabis margins land somewhere around 32.5%, the operating profits of the largest companies in the cannabis sector would be $6.5 billion. Taking out 20% for taxes,the total net profits of each of the largest marijuana companies would be $5.2 billion. Both alcoholic beverage and tobacco stocks normally trade around 20 times their forward earnings. Based on that market-average multiple, that equates to a market cap of over $100 billion. Thus, today’s marijuana-products makers can one day turn into $100 billion companies. The biggest knock against marijuana stocks today is valuation. But over the long-term, the most valuable marijuana stocks may eventually be worth $100 billion as the global cannabis market grows to rival the global alcoholic beverage and tobacco markets. In reality, the big risk facing marijuana stocks isn’t valuation. It’s execution. As a result, investors shouldn’t avoid marijuana stocks. Instead, they should be selective about which ones they buy. My top picks are CGC stock and ACB stock. They are today’s leaders and they have the highest chance of turning into $100 billion companies.